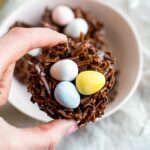 These no bake chocolate coconut nests are such an easy Easter treat only require three ingredients: shredded coconut, chocolate chips and candy eggs! Vegan and gluten-free. 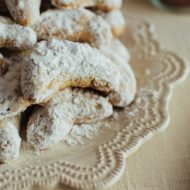 Of all treats I’ve been making lately, and there have been quite a few, these little nests are Isaac’s favorite! I’m pumped because they’re also the easiest and fastest to make. Plus they involve my favorite Easter candy ever, Cadbury Mini Eggs. 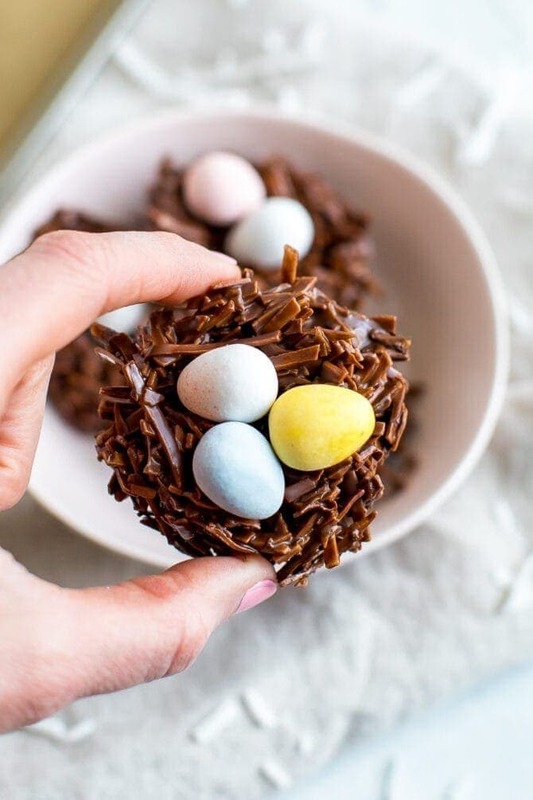 These chocolate nests are inspired by the traditional chocolate nest candies. Except these are not made with chow mein noodles and corn syrup. You’re welcome! 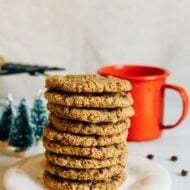 Whether these are for you or kiddos in your life, no one needs to feel guilty about snacking on these. They are the cutest little treat for Easter or springtime in general. You’ll start by toasting your coconut. Either spread the shredded coconut on a baking sheet or toast in a saucepan. No matter which method you choose, pay close attention! Shredded coconut can burn easily so don’t get distracted. After your coconut is done toasting (remember, watch it carefully), let it cool while you melt the chocolate. 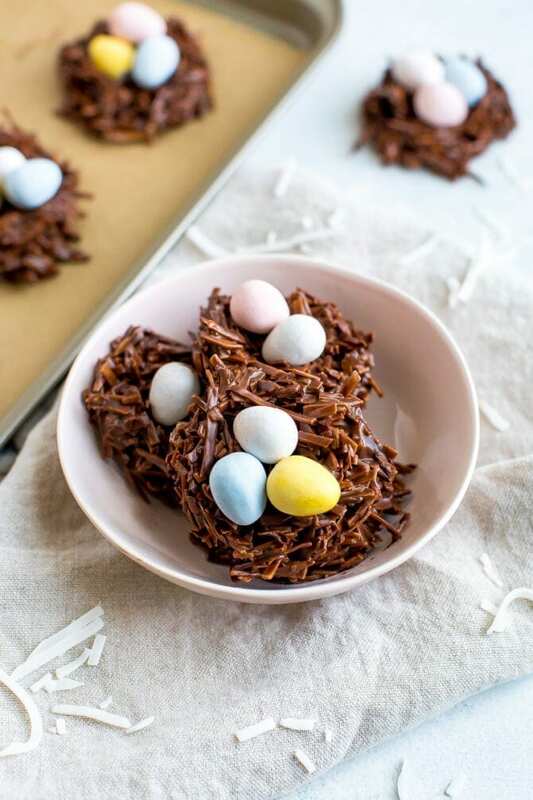 You’ll mix the melted chocolate with cooled shredded coconut in a medium bowl and then scoop 2-3 Tablespoons of the mixture to a baking sheet lined with parchment paper and roughly shape into a nest. Add 2-3 candy eggs to each nest and let sit at room temperature or pop into the refrigerator to speed up the process. If you have a sweet tooth like me, it’s HARD to pass by the treat aisle in the grocery store. Sure, there’s always a treat aisle, but around Easter and Halloween I swear they clear out two to four aisles for sweets. Makes me wonder if candy consumption really grows that much that they need to increase their inventory 4x?! I’m looking at you, Target! Anyway, I love my sweets but I am also mindful of what I’m putting in my body so I love when I can recreate childhood favorites with better ingredients. And with this one, I still get to enjoy a few of my favorite candies. Win, win! 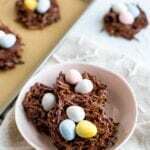 If you make these No Bake Chocolate Coconut Nests, be sure to leave a comment and start rating below letting me know how it turns outs. 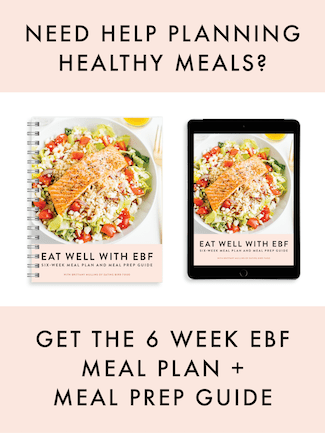 Your feedback is so helpful for the EBF team and other EBF readers. Preheat oven to 400°F. Spread the shredded coconut onto a baking sheet for toasting. Place in oven for 5-10 minutes, until coconut is a light golden brown color. Make sure to stay in the kitchen watch the coconut, as it can easily go from toasted to burnt. Alternately, you can toast the coconut in a pan on the stove-top. Let toasted coconut cool on baking sheet while melting chocolate. Add chocolate chips to a microwave-safe bowl and melt in 20-30 second increments until the chocolate is melted. Add cooled coconut and melted chocolate into a large bowl and toss to combine. 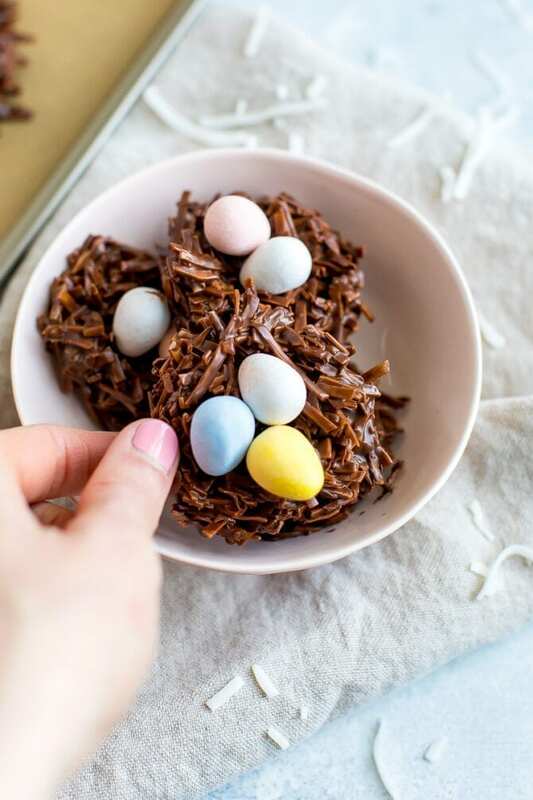 Use a spoon or ice cream scoop to scoop about 2-3 Tablespoons of the coconut chocolate mixture onto a piece of parchment and shape into a nest. Top each nest with 2-3 eggs. Repeat with remaining ingredients. Let nests set at room temperature or place in the fridge or freezer to speed up the process. Store leftover nests in an airtight container at room temp for 4-5 days or in the fridge for longer storage. If you store them in the fridge, let sit for about 5-10 minutes before eating. 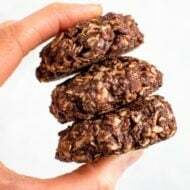 If you want these to be vegan you’ll need to use non-dairy chocolate chips and vegan jelly beans, vegan candy eggs or macadamia nuts. These look so good! 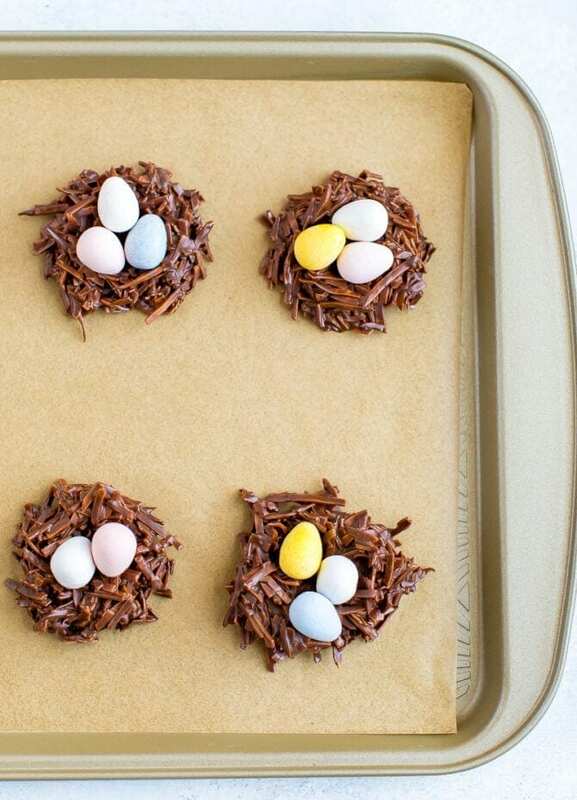 Im going to try and make these for Easter this year! Cadbury mini eggs aren’t vegan I’m afraid! No, they definitely aren’t. To make these vegan you can use vegan candy eggs or jelly beans or use the macadamia nuts. I cannot seem to find the longer shredded coconut anywhere! I searched Whole Foods, Target, and Amazon. Any suggestions? Hi Brittany! These look awesome. How do you think coconut flakes would turn out instead of shredded coconut? Yes, I think so! Let me know if you try it!